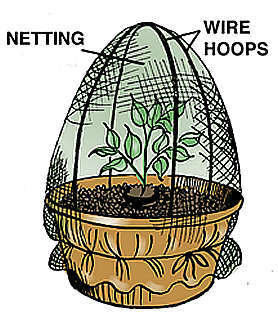 The first thing you must do in your goal to rear butterflies is collect sufficient eggs.A satisfactory method is to plant the food plant for the particular species in a large flower netting, This can be made of chicken wire or some sort of plastic garden netting, kept in position by hoops of wire bent into arches and secured by tying string around the bottom, as shown in the illustration. Such a device allows plenty of room for the butterfly to fly around freely. A few flowers should be provided for her own feeding purposes. If the pot is placed in the sunshine, most species will lay plenty of eggs, though some will not oblige so easily. so persistance is required at this stage of the rearing process.